Japan has pledged not to produce more plutonium than it can consume. Serious questions are emerging, however, about whether it can uphold this commitment. Japan is the only non-nuclear-weapon state with a program to extract plutonium from the spent fuel produced in nuclear reactors—a process termed reprocessing—to fabricate more fuel. Because plutonium can be used directly in the manufacturing of nuclear weapons, Japan has, in keeping with internationally recognized best practice, pledged not to produce more plutonium than it can consume. Serious questions are emerging, however, about whether it can uphold this commitment. Japan is entrapped in reprocessing. Commitments made by the national government to local communities to facilitate the development of Japan’s nuclear industry and, in particular, its industrial-scale reprocessing facility, Rokkasho Reprocessing Plant (RRP) make RRP’s operation effectively inevitable. Entrapment results in domestic pressure to operate RRP. In 2012, that pressure forced the administration of then prime minister Yoshihiko Noda, which sought to phase out nuclear energy, into supporting reprocessing. Following the March 2011 Fukushima Daiichi nuclear accident, Japan faces severe challenges—including domestic politics—in bringing nuclear reactors back into operation. Over the next decade, Japan is very unlikely to restart more than about half of the reactors designated for plutonium consumption. Within a decade, Japan will probably be producing more plutonium than its reactors can consume. Japan could take steps to reduce its supply of plutonium. It could operate RRP at a lower throughput and negotiate with the United Kingdom, and possibly France, over their taking ownership of Japanese plutonium stored in Europe. Japan might also conduct research into alternative means of disposing of plutonium, possibly in collaboration with the United Kingdom and the United States. While operating RRP, Japan could take the steps necessary to create the option of phasing out reprocessing in the future. Such steps would include changing the law to permit funds set aside for waste management to be used for the direct disposal of spent fuel and ensuring that Japan’s planned geological repository is licensed for spent fuel. Japan would also need to secure additional interim storage facilities for spent fuel, possibly by offering greater financial incentives to any prefecture willing to host one. The Japanese government must take ownership of the problem. No realistic solution can be implemented solely by the private companies that own Japanese plutonium and operate RRP. The government should develop a plutonium management strategy as soon as possible. Waiting will merely exacerbate the challenges. Other states considering reprocessing should design programs so they do not become entrapped. A critical step would be to ensure adequate storage space for spent fuel. U.S. President Barack Obama has invested unprecedented political and financial capital in U.S. nuclear threat reduction programs. Fissile material minimization efforts were originally motivated by nonproliferation—preventing the further spread of nuclear weapons among states—and this remains one of the goals, even if, for reasons of diplomatic courtesy, Washington rarely says so explicitly. Because fissile material accumulations significantly reduce the time required to manufacture nuclear weapons (or, equivalently, increase the number of nuclear weapons that can be manufactured in a short time), they exacerbate proliferation risks. International Atomic Energy Agency (IAEA) safeguards, which non-nuclear-weapon states party to the Nuclear Non-Proliferation Treaty are required to accept, mitigate these risks somewhat, but do not solve them given that their purpose is to detect—not prevent—the diversion of nuclear material, that is, its removal from declared and monitored activities. The stockpiling of nuclear material, which reduces the time available for responding to a diversion, makes an effective response to proliferation threats more difficult and less likely. It is for this reason, for example, that the nuclear agreement with Iran that was concluded in July 2015 commits Tehran not to produce any HEU (or, indeed, to enrich to anywhere near that level) and to reduce its stockpile of low-enriched uranium drastically (given that this stockpile could be converted into HEU relatively rapidly). Currently, no state is producing HEU for nonmilitary purposes, but six do have civilian reprocessing programs, which aim to separate plutonium from spent nuclear fuel for the purpose of manufacturing more fuel.4 Along with the United States and various other countries, all six of these states have committed to adhere to the IAEA’s Guidelines on Plutonium Management, which explicitly recognize the proliferation risks associated with separated plutonium and underscore the “importance of balancing supply and demand.”5 As such, these states have made a political commitment not to stockpile more separated plutonium than the so-called working stocks they need to have on hand to implement their fuel-cycle policies. Of the six states with civilian reprocessing programs, only one—Japan—is a nonnuclear- weapon state. Of the six states with civilian reprocessing programs, only one—Japan—is a non-nuclear-weapon state. Japan’s commitment to and compliance with IAEA safeguards have been exemplary. However, starting in the 1980s, there were growing concerns that Japan lacked the ability to use the plutonium it planned to separate and, as a consequence, was on course to stockpile large quantities of the material.6 In response, Tokyo pledged, in 1991, not to separate plutonium that it could not burn in its reactors and has repeated this no-excess pledge on many occasions since.7 It further strengthened this pledge in 1997 by agreeing to adhere to the IAEA’s Guidelines on Plutonium Management. In fact, since the Fukushima Daiichi accident, Japan has considered doing just that. In the summer of 2011, the government launched a major review of Japanese energy policy. Pushed by a tide of public concern about nuclear safety, it eventually decided on the goal of eliminating nuclear energy by the 2030s, and was advised that it should also abandon reprocessing by the Japan Atomic Energy Commission—the cabinet’s most important advisory body on nuclear energy and the government organization responsible for nonproliferation.12 The result was a serious discussion about shutting RRP. This discussion was short-lived, however. It sparked a furious backlash from the tiny community in the remote part of northern Japan that hosts RRP and strongly supports its operation. Remarkably, this community had garnered the power, should the plant be shut, to threaten a domestic crisis by demanding the removal of the spent fuel that was already stored there, and a simultaneous international crisis by refusing to import nuclear waste from abroad that Japan was contractually obliged to accept. These threats were so potent that the administration of then prime minister Yoshihiko Noda was forced into supporting the continuation of reprocessing, even while advocating for a phaseout of nuclear energy.13 The result of this inherently contradictory policy would have been the accumulation of huge quantities of plutonium. In the end, the Noda administration’s plan could not even gain the approval of the whole cabinet (for reasons unrelated to nonproliferation). Then, in December 2012, the Liberal Democratic Party defeated Noda’s Democratic Party of Japan at the polls. Subsequently, a new coalition government, led by Prime Minister Shinzo Abe, adopted an apparently more coherent energy plan, under which Japan will continue with both reprocessing and nuclear power.14 However, the process of crafting the Noda administration’s energy plan provides a graphic illustration of just how entrapped in reprocessing—or, at least, in the operation of RRP—Japan has become. First described by the political scientist William Walker in regard to the United Kingdom’s reprocessing program, entrapment occurs when the web of political, legal, and financial commitments required to facilitate major projects severely reduces a government’s flexibility to adapt to changing circumstances.15 In the British case, the most important commitments were, coincidentally, contractual obligations to reprocess Japanese spent fuel. By contrast, domestic politics, which was a relatively minor consideration in the United Kingdom, is the most important mechanism entrapping Japan. Specifically, Japanese local politicians have acquired a remarkable ability to prevent significant changes to the country’s nuclear policy. They have assumed the status of veto players—individual or collective decisionmakers whose agreement is required for the status quo to be changed—to use the political science jargon. These local politicians have now placed the national government in an uncomfortable double bind.16 Any renewed attempt to back away from reprocessing would be met with fierce resistance from the local politicians connected with RRP. Meanwhile, the local politicians connected with reactors will severely complicate the task of consuming the plutonium that RRP produces. As a result, there is a serious risk that, within a decade, Japan’s already-significant stockpile of separated plutonium will start to grow rapidly. Even if Japan’s plutonium policies are being driven by domestic politics—and not the maintenance of a nuclear weapons option, as is often argued17—it would, for at least three reasons, be shortsighted to conclude that the country’s existing plutonium stockpile (let alone the possibility that it may grow rapidly) does not pose serious security risks. Second, some of Japan’s neighbors believe (incorrectly) that Tokyo is accumulating plutonium for military purposes. China has been particularly vocal in its criticism, and although its statements are partly political opportunism at a time of particularly poor Sino-Japanese relations, they probably also reflect genuine concern about Japan’s long-term intentions.19 As a result, by producing yet more plutonium without a credible plan to use it, Japan is likely to exacerbate regional tensions further. Given these risks, Japan has a clear interest in ensuring that it lives up to its commitments by not accumulating even more plutonium and, ideally, drawing down its existing stockpile over time. Developing a credible way forward requires understanding the nature of the challenges Japan faces, the most important of which is the domestic politics that creates pressure to separate plutonium while hindering Japan’s ability to use it. To this end, this study analyzes both the causes of Japan’s entrapment in reprocessing and the challenges it now faces in trying to burn plutonium after the Fukushima Daiichi accident, before discussing a politically realistic way forward. Tokyo’s ultimate goal, however, was always to acquire an indigenous reprocessing capability. To this end, after a pilot facility began to separate plutonium in 1977—against considerable opposition from the United States, which had come to oppose reprocessing by then—the search for a site for an industrial-scale facility began. The utilities responsible for generating electricity were nominally in charge of this project and, in 1984, their umbrella organization, the Federation of Electric Power Companies, formally approached Rokkasho Village in Aomori Prefecture, in the far north of the main Japanese island of Honshu, with a request to host a number of nuclear facilities, including the reprocessing plant. The selection of this site, apparently at the “suggestion” of the federal government, appears to have been motivated as much by regional development goals as any technical merits it offered.22 Rokkasho Village and the surrounding Shimokita Peninsula were one of the least-developed parts of the country. Moreover, a series of government-led development initiatives over the previous twenty-five years had all ended in failure. In the first such project, a company to manufacture sugar out of domestically grown beets was established in 1959.23 However, the project was terminated when the government permitted sugar imports from abroad, depressing prices. Three further projects finished equally inauspiciously because, it is widely believed in Aomori, of a lack of commitment by the central government. Aomori Prefecture’s concerns about what might happen if the project were canceled were thrown into sharpest relief by the prospect of spent fuel and high-level nuclear waste being shipped into the prefecture. The complex at Rokkasho includes storage facilities for the nuclear waste produced by both Rokkasho Reprocessing Plant (RRP) and the reprocessing of Japanese spent fuel in France and the United Kingdom. There is no other site in Japan licensed to store them. Aomori politicians did not want to become responsible for managing this waste for the long term, and right from the start of the project, its fate was an issue. In 1985, while the prefecture was considering whether to host the facility, it was assured by the national government that the ultimate disposal of the waste from reprocessing would not be Aomori’s responsibility.27 In 1994, the prefecture secured a promise from Tokyo that such disposal would not take place in Aomori and also that high-level waste would be stored at Rokkasho for no more than fifty years.28 Then, in April 1995, the governor of Aomori at the time, Morio Kimura, prevented the docking of a ship carrying the first batch of high-level waste from France. He only relented, after a day-long standoff, when he secured another pledge from the federal government that Aomori would not become a permanent disposal site.29 Although this pledge was essentially a repeat of the one made the previous year, the governor did demonstrate his willingness to block a foreign ship from docking—with the consequent risk of an international incident—thus creating a powerful source of leverage on the central government in Tokyo and effectively establishing himself as a veto player. Aomori also levies taxes on a range of nuclear activities, including the import and storage of spent fuel and the production of high-level waste from reprocessing. The total income from these taxes is currently expected to be about ¥19 billion annually (approximately $160 million per year at current exchange rates), though not all of this revenue is associated with reprocessing specifically.42 In addition to receiving a share of this income, Rokkasho Village also collects its own fixed asset taxes (a property tax on businesses). The nuclear facilities represent, by far, the single largest contribution to this revenue stream, which totaled about ¥5.25 billion (approximately $62 million) in 2010—an amount that is more than seven times larger, on a per person basis, than the national village average.43 The reprocessing plant is a key source of local employment and has stimulated the economy indirectly, given that many local firms were employed as subcontractors in the plant’s construction. The reprocessing plant is a key source of local employment and has stimulated the economy indirectly. Although both Aomori Prefecture and Rokkasho Village have benefited economically from reprocessing, it is not surprising that the latter worries mainly about the economic effects of terminating reprocessing, whereas the former is also concerned with the fate of spent fuel and high-level waste. Rokkasho benefits economically from the reprocessing plant much more, in relative terms, than the prefecture. Aomori, by contrast, must grapple with issues relating to the management of spent fuel and high-level waste, if for no other reason than a lack of expertise and capacity in the village. Nonetheless, even if the two entities have slightly different emphases to their concerns, they share a clear common interest in ensuring the project’s continuation. They have also developed the means to try to deter the central government from changing policy. These means were put to the test in 2012. In June 2011, three months after the Fukushima Daiichi accident, then prime minister Naota Kan created the Energy and Environment Council (EEC), consisting of cabinet ministers, to forge a new energy policy. In 2010, the last full year before the accident, nuclear energy was used to generate about 26 percent of Japan’s electricity, and the government’s energy plan from that year called for this contribution to increase to around 50 percent by 2030.44 As part of the review, the Japanese bureaucracy was tasked with studying three options under which nuclear energy’s contribution would be reduced to 0 percent, 15 percent, or 20–25 percent (a fourth option—maintaining existing policy—was briefly considered but quickly rejected). At this stage, however, there was a widespread assumption that the EEC would not support the complete phaseout of nuclear energy. At the time the review got under way in mid-2011, the government sent out mixed messages about whether it would support a complete phaseout.47 As 2011 wore on, ministers largely stopped talking about a phaseout and, by 2012, appeared set to pick the 15 percent option.48 As a result, although the JAEC had recommended in mid-2012 that phasing out nuclear energy would require abandoning reprocessing, there was no impetus to plan for such an eventuality and, indeed, no evidence that any planning took place. Unsurprisingly, therefore, the policy review did not spark too much concern in Aomori Prefecture or Rokkasho Village initially. In the fall of 2011, Rokkasho did little more than call for the current fuel-cycle policy to be maintained.49 Aomori Governor Shingo Mimura took various opportunities, meanwhile, to remind bureaucrats involved in the review about the central government’s promises to Aomori. In January 2012, for example, at a meeting with the JAEC, the governor explicitly threatened that, if reprocessing were terminated, he would expel not only the spent fuel being stored in Aomori but also the high-level waste that had been imported from France and the United Kingdom.50 (Whether he actually had the power to demand the removal of this waste is unclear, but he certainly did have the power to prevent ships carrying high-level waste from using port facilities in Aomori, as his predecessor had done, and could thus prevent the import of more.) These statements were, however, unremarkable; he had said similar things to the same committee even before the Fukushima Daiichi accident. Under intense pressure from the public to phase out nuclear energy and intense pressure from Aomori and Rokkasho to continue with reprocessing, it opted to do both. The EEC did not explicitly restate Japan’s policy against stockpiling excess plutonium, let alone present a credible plan to use the plutonium that was to be separated at RRP while phasing out the nuclear reactors that were the only means to consume it.61 Nominally, it fell to the JAEC to protect nonproliferation interests. However, the commission had steadily lost power over the decades. Moreover, it had been further weakened by this time, even though it had no role in safety, because it was widely seen as being part of the so-called nuclear village—the group of politicians, energy company executives, bureaucrats, and scientists that advocated for nuclear energy in Japan and was widely blamed for the Fukushima Daiichi accident.62 As a result, there was no effective nonproliferation champion in government. Did the EEC need to back down? Critics of Japan’s reprocessing policy have since argued that Aomori Prefecture and Rokkasho Village’s threat was not credible, because relocation of the fuel would have been a virtual impossibility and would have deprived them of significant revenues. These critics have argued that the central government could have “negotiated fairly” with Aomori and Rokkasho to enable the continued storage of spent fuel there even after terminating reprocessing.63 They may be right. If negotiations had taken place much earlier in the process, it is just possible a solution could have been found. That said, the outcome to such negotiations would, at best, have been highly uncertain; given the history of betrayal to which Naomichi Fujikawa referred, Aomori and Rokkasho might well have been strongly disinclined to acquiesce to the abandonment of reprocessing in favor of yet more promises from the central government. Although the proximate cause of the Noda administration’s decision to continue with reprocessing was the threat from Aomori and Rokkasho, this outcome was probably overdetermined. Even if the local community had been supportive of a shutdown, at least two other pressures might well have forced the government into operating RRP, at least for an interim period. A lack of storage space for spent fuel at reactors was perhaps the most vexing. This timeline would have been rather challenging. Licensing a facility and procuring dry casks typically takes a few years. Moreover, securing consent for dry-cask storage from local communities tends to be difficult, and even more time-consuming. Once again, the desire not to become a de factopermanent storage site for spent fuel is a major cause of resistance. This resistance is particularly strong in prefectures that do not benefit, or benefit only marginally, from the electricity produced in the reactors that they host. The desire not to become a de facto permanent storage site for spent fuel is a major cause of resistance. To complicate matters further, even in prefectures that do receive the electricity from their nuclear reactors, consent to build a dry-cask storage facility can be slow in coming. For example, a 2008 plan from Chubu Electric Power Company to build a dry-cask storage facility at Hamaoka Nuclear Power Plant foresaw the facility becoming operational in seven years.75 Because construction and licensing takes only two or three years, this timeline implied four or five years would be needed to secure local consent, even though, to make the proposal more palatable, it was presented as part of a package that also involved building a new reactor to prevent job losses resulting from the shutdown of two older units. Given the potential for serious local opposition, there was a real risk that, had the government terminated reprocessing in September 2012, some reactors might have run out of storage space for spent fuel and been forced to close. To be sure, this outcome was not an absolute certainty. The tax revenues and subsidies associated with hosting dry-cask storage facilities coupled with the job losses that would have resulted from reactor closures might have been enough to overcome any opposition. Furthermore, in the past, the central government has generally not attempted to convince local communities to accept dry-cask storage (possibly because it might undermine the rationale for reprocessing). A major push by the central government in favor of dry-cask storage might also have helped alter local calculations. That said, the somewhat chaotic process of creating a new energy policy did not exactly encourage the careful crafting of a well-designed plan to develop dry-cask storage in parallel with a decision to terminate reprocessing. Ultimately, therefore, the lack of storage space for spent fuel was a second factor that made an immediate exit from reprocessing in 2012 extremely difficult. A third factor was the financing arrangements for RRP and, in particular, the need for JNFL to pay off its loans. This problem attracted less attention than the others, but its consequences would probably have been felt much sooner—almost immediately, in fact—had the Noda administration terminated the reprocessing program in September 2012. In practice, however, there were two challenges to doing so. First, in the febrile and unpredictable political environment at the time, there was no guarantee at all that the Diet would have agreed to the necessary legislation; phasing out nuclear energy was controversial, and some members who wanted a phaseout might still have supported the continuation of reprocessing. Second, because the EEC failed to address the fuel cycle until very late in its deliberations, it did not give itself enough time to develop an exit strategy that would have eased the concerns of the financial markets. In fact, according to its minutes, this issue wasn’t even discussed at the critical meeting of the EEC on September 4, 2012.81 The reason for this omission is unclear (and worrying from the standpoint of democratic accountability), but it does illustrate how little consideration was given to the practicalities of terminating reprocessing. Two considerations seem to have been noticeably absent from the government’s decision to maintain reprocessing: hedging and the sunk-costs fallacy. There is no evidence, however, that hedging, as it is called, was a consideration for the distinctly more dovish DPJ government. Moreover, Ishiba’s vague reference to “nuclear plants” is telling. Japan’s nuclear program may have started, at least in part, as a hedge, and some politicians apparently continue to view it as such (indeed, exactly the same could probably be said for most states with nuclear power programs). However, this form of existential hedge—which essentially goes no further than maintaining a nuclear infrastructure—is quite different from the claim that Tokyo has a deliberate strategy of stockpiling plutonium to enable rapid proliferation. Separately, some analysts have argued that the persistence of reprocessing in Japan is a sunk-costs fallacy: the misguided desire not to waste unrecoverable costs that have already been incurred.83 Indeed, sunk costs may well weigh on the minds of the Japanese bureaucrats responsible for energy policy.84 They probably also help explain why the LDP, which fostered Japan’s nuclear program during a period of almost-uninterrupted rule lasting for more than half a century, continues to support reprocessing. However, sunk costs cannot explain why Japan decided to persist with reprocessing in 2012. After all, the DPJ-led government then in office had no particular commitment to reprocessing and was swept into power, in August 2009, on a platform that promised change; it painted overturning existing policy as a virtue. Indeed, if sunk costs really had been a serious concern, the government would presumably have balked at seeking to phase out nuclear energy by the 2030s, which would have entailed closing a number of nuclear reactors prematurely. Negotiate with the Diet to permit a change in the law to enable the reprocessing fund to be used to bail out JNFL. Some of the difficulty that his administration faced was self-inflicted. Because there was an assumption throughout much of the review that nuclear energy would not be phased out, there was, as a corollary, an assumption that reprocessing would continue. As a result, there was simply not the time to develop a credible exit strategy from reprocessing when serious discussions about phasing out nuclear energy began. The government’s general weakness—a result of its unimpressive performance in many areas—probably also militated against its undertaking of the complex and politically sensitive project of shutting RRP. The outcome might just have been different if the government had been stronger and had considered reprocessing much earlier in the process of formulating a new energy policy. That said, many of the challenges that the Noda administration faced were structural: the need to act on all fronts more or less simultaneously, the existence of powerful veto players—most notably local politicians in Aomori—who had little reason to compromise, the very real risks that any one of the necessary negotiations might fail, the absence of a strong nonproliferation voice within the government, and the entrenched bureaucratic support for reprocessing. In short, the decision to continue with reprocessing—at least for some time—was effectively inevitable. What was certainly not inevitable was the administration’s subsequent failure to develop a long-term plan to extricate Japan from reprocessing more gradually—“strand by strand.” The absence of any realistic alternative to restarting RRP did not remove the risk that phasing out nuclear energy while continuing with reprocessing would result in a large imbalance between plutonium supply and demand. The Noda administration could at least have started the process of developing a credible plan to address this problem. Its failure to do so may yet have consequences. The Abe administration that took power in 2012, like all of its LDP predecessors, is committed to reprocessing and seeks to start RRP as soon as possible. This is as much a political reality as it is a policy choice, as the domestic pressures to operate the facility remain as strong as ever. However, the government has also recommitted not to possess “reserves of plutonium of which use is undetermined.”86 Moreover, by executing a sensible U-turn on nuclear energy—which is once again seen as an “important base-load power source,” according to Japan’s new Strategic Energy Plan87—the Abe administration has created, on paper at least, a way of realizing this commitment. In reality, restarting a number of the reactors designated for plutonium burning is likely to prove extremely difficult. A serious risk remains that Japan’s domestic plutonium stockpile will, in the next few years, start to grow rapidly. In 1997, therefore, Tokyo decided that, as a stopgap measure while fast breeder reactors were being developed, plutonium would be consumed in existing power reactors in the form of mixed oxide (MOX) fuel—a plan it termed plu-thermal.92 To this end, the Federation of Electric Power Companies announced that the utilities aimed to burn MOX in sixteen to eighteen reactors by 2010. Significant progress was made in implementing this plan prior to the Fukushima Daiichi accident—although there were difficulties and setbacks. Long delays were encountered in the construction of a MOX-fuel-fabrication facility that Japan originally sought to have in operation by 2000.93 In the end, construction of what came to be called J-MOX only started in 2010. Japanese utilities were able to compensate for this delay by sourcing all of their MOX fuel from France and the United Kingdom (until the latter encountered problems with MOX fabrication that it has yet to solve). But without J-MOX, Japan could not use any of its plutonium separated onshore. Japanese local officials almost certainly have more ability to influence reactor operations than their counterparts in any other country. Even before the Fukushima Daiichi accident, therefore, it seemed likely that full implementation of the MOX-use plan would have to be further delayed, and there was some room for concern about whether consent for sixteen reactors, let alone eighteen, could be secured. The Fukushima Daiichi accident has thrown Japan’s nuclear energy sector—and, as a result, its MOX-use plan—into disarray. By law, Japanese reactors must be stopped for safety inspections once every thirteen months (at which time refueling also takes place). However, following the Fukushima Daiichi accident, the Nuclear and Industrial Safety Agency, which was then Japan’s regulator, prohibited reactors from restarting, pending a more comprehensive safety review. Just two units at Oi passed this review and were permitted to restart before a new regulator, the Nuclear Regulation Authority (NRA), started its work in September 2012. This new body revised Japan’s regulatory standards and then started the long process of assessing reactors’ compliance. During this process, the two units at Oi were shut down and, since September 2013, Japan has had no operating reactors. The Fukushima Daiichi accident has thrown Japan’s nuclear energy sector—and, as a result, its MOX-use plan—into disarray. There are four potential barriers to restarting a reactor and then using it to consume plutonium. First, the utility must decide that it actually wants to restart the reactor. Because of the cost of the safety enhancements needed to meet the new standards, utilities have so far decided to decommission five older and smaller units.104 Second, the NRA must certify the reactor’s compliance with the new safety standards. Third, the relevant local authorities must consent to the reactor’s restarting. Finally, consent for MOX burning must also be in place. In practice, this final step will either involve convincing local authorities to give consent or ensuring that it is not retracted. Each of these steps could prove problematic. In fact, even in the plausible best-case scenario, Japan will be able to burn MOX in only eleven of the sixteen to eighteen reactors earmarked for that purpose. The prospects for MOX burning at Kashiwazaki-Kariwa are marginally better—but still poor in absolute terms. Relations between TEPCO and Niigata Prefecture were strained even before the accident, and the prefecture had not consented to MOX burning. Unsurprisingly, relations are much worse now. In an October 2012 poll, a majority of Niigata residents opposed restarting the nuclear reactors in their prefecture.108 More importantly, the governor of Niigata, Hirohiko Izumida, is a high-profile critic of nuclear power in general and TEPCO specifically.109 Although he has not said definitively that he would refuse consent to restart the reactors, he has set conditions that would allow him to delay the process indefinitely. For example, Izumida has said he will commission his own investigation into the Fukushima Daiichi accident and the effectiveness of the new safety standards.110 Moreover, even if he were to consent to a restart (which is not completely impossible given the employment consequences of shutting down the plant), it is highly unlikely he would reverse himself on MOX too. The politics surrounding the restart of Tokai Daiini are similar. Local opposition to a restart is so intense that when the plant’s owner, the Japan Atomic Power Company, applied to the NRA for safety certification, it had to emphasize that it was not applying for permission to actually restart the reactor.111 Moreover, consent to use MOX was not secured before the Fukushima Daiichi accident; gaining it now is likely to be extremely difficult. If these problems weren’t enough, Tokai Daiini is also a relatively old unit (it started operating in 1978), creating two additional problems. First, it was not designed with safety features that are now requirements—most notably fire-resistant cabling.112 Whether the NRA will accept the operator’s proposed work-arounds is unclear. Second, for reactors to operate for more than forty years, relicensing is required. This process is a new requirement, and it is unclear what standards will be applied and hence whether Tokai Daiini will be eligible to operate beyond 2018 (or, if it is, whether the operator will be willing to pay for any required upgrades). Finally, in early 2014, the governor of Shizuoka Prefecture, Heita Kawakatsu, retracted consent to burn MOX at unit 4 of Hamaoka—the first, and to date only, such retraction since the Fukushima Daiichi accident.115 (For its part, the plant’s owner, Chubu Electric Power Company, has stated it is currently focused on improving safety and has no target date for MOX burning, but has not retracted its intention to use MOX fuel eventually.116) On top of that, the prospects for restarting Hamaoka are uncertain. Kawakatsu is noncommittal on whether there are any circumstances under which he would consent to a restart.117 However, he is critical of nuclear power in general (though not of Chubu Electric Power Company, specifically) and won reelection in 2013, following a campaign in which nuclear power was a key issue, by pledging to hold a local referendum on the restart of Hamaoko.118 Taken together, all these factors make the use of Hamaoka unit 4 for plutonium consumption unlikely. Besides these six or seven most-at-risk reactors, ten or eleven others are designated for MOX burning. If each one of these eleven reactors were restarted (or, in the case of Ohma, started) and consent to load MOX in each one is secured—the plausible best-case scenario—Japan could burn just 4 metric tons of fissile plutonium annually,119 some of which is to be sourced from Europe. When operated at full capacity, however, Rokkasho Reprocessing Plant (RRP) is intended to produce about 4.5 metric tons of fissile plutonium per year.120 Under these circumstances, Japan’s domestic plutonium stockpile would grow by at least 0.5 metric tons per year and, more likely, by around 1.5 metric tons per year, depending on exactly how much MOX is sourced from Europe. To be sure, there is some chance—albeit a rather small one—that this prediction is wrong and that one or more of the seven most-at-risk reactors will reopen and be used to burn MOX; it is not impossible, for example, that an anti-nuclear governor in Niigata or Shizuoka could lose reelection to a pro-nuclear opponent. By the same token, however, there is also a chance—a rather large one—that it will be impossible to burn MOX in some of the other eleven reactors. For example, in the hypothetical scenario that each of these eleven reactors had an 80 percent probability of restarting, the chance that all of them would do so is less than 10 percent (in fact, the most likely outcome, in this case, would be for eight of the eleven reactors to restart). In some of these eleven reactors, the prospects for MOX burning are extremely good; in others, the outlook is much less positive. In reality, of course, the situation is more complicated; in some of these eleven reactors, the prospects for MOX burning are extremely good; in others, the outlook is much less positive. 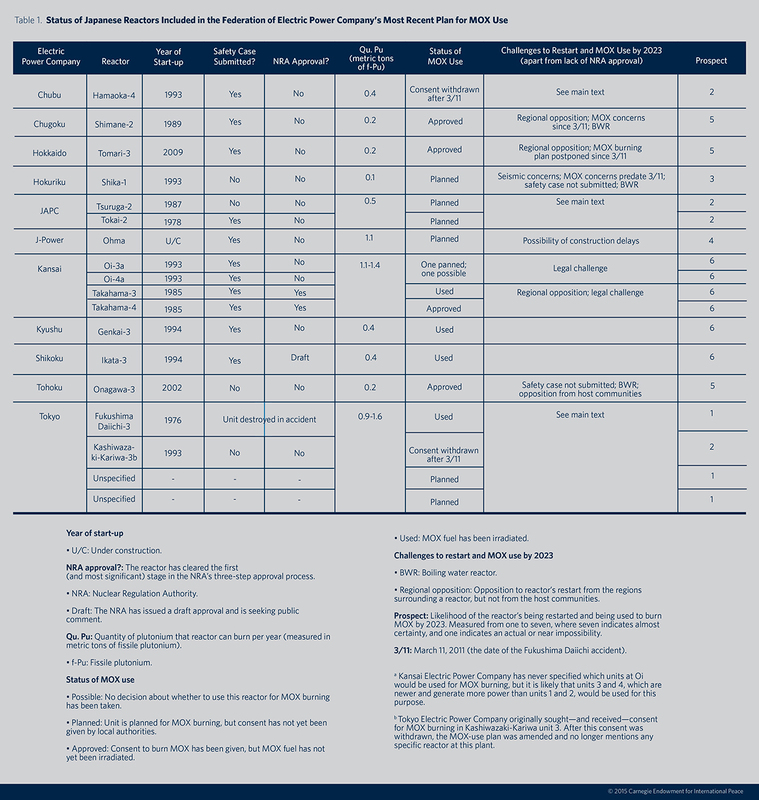 By way of a summary, table 1 lists all of the reactors in Japan designated for MOX burning and rates each on a scale of one to seven in terms of the likelihood of its reopening and its being used for plutonium consumption by 2023 (seven indicates a near certainty, and one indicates an actual or near impossibility). The significance of 2023 is that RRP is likely to be operating at full capacity by then, assuming three more years to complete the safety assessment and solve any additional problems encountered during start-up, and five years to ramp up to full production. Seismic concerns. An NRA investigation team has indicated that it is likely to conclude that a fault under Shika unit 1 is active.121 If the final report reaches the same conclusion and is adopted by the NRA, this reactor will be forced to close. Local opposition to a restart. There is significant local opposition to the restart of Onagawa.122 Less problematically, at three other plants—Shimane, Takahama, and Tomari—the host communities are generally supportive of a restart but the surrounding municipalities are not.123 Currently, consent from such municipalities is not necessary to restart a reactor. However, if public pressure forces operators to consult with them, much longer delays could arise. Legal challenges. There have been legal challenges to reactor restarts across Japan, most of which have been unsuccessful. A district court in Fukui Prefecture has, however, issued separate injunctions against the restart of reactors at Oi and Takahama.127 Ultimately, it seems likely these rulings will be overturned on appeal, but they do create additional uncertainty. Status of the NRA’s assessment. Uncertainty about a reactor’s future is increased where the operator has not yet applied to the NRA for a safety assessment, and to a lesser degree, where the NRA has not yet completed its assessment. Type of reactor. There are two types of reactors in Japan: boiling water reactors and pressurized water reactors. The former requires additional safety enhancements and, so far, the NRA has been focusing its efforts on assessing the safety of the latter. The timeline for restarting boiling water reactors is, therefore, unclear. All of these considerations strongly suggest that, in addition to the seven most-at-risk reactors, it is likely that a few others will not be available for MOX burning by 2023 (even if it is not possible to specify exactly which ones). A very simple statistical model, based on the ratings in the table, suggests that, in the most likely case, MOX burning will take place in only eight or nine reactors by 2023, permitting roughly 3 metric tons of fissile plutonium to be consumed each year.130 In this case, Japan’s stockpile would grow by 1.5 metric tons of fissile plutonium per year, even if no material were sourced from Europe. If such sourcing does take place, the growth is likely to be around 2.5 metric tons annually. In light of these challenges, in November 2014, the Federation of Electric Power Companies announced its intention to revise its MOX-use plan to prevent an imbalance in the supply and demand of plutonium.131 It acknowledged that full implementation of the current plan by 2015 was impossible. It also hinted that the utilities would try to identify additional reactors in which plutonium could be burned—though it did not promise explicitly to do so. There are at least four reasons, however, why this kind of demand-side solution is likely to be extremely difficult to implement. First, there could be a relatively small number of reactors—perhaps fewer than ten—that are suitable for adding to the MOX-use plan. Most obviously, some reactors not currently designated for MOX burning may not reopen. There are other less apparent challenges too. Local objections to MOX would, presumably, apply to all units at a given site. Thus, if the governor of Shizuoka continues to refuse consent for MOX use in Hamaoka unit 4, he would, almost certainly, adopt the same policy toward both the other active units at that plant, thereby precluding three reactors from being used for MOX burning. Moreover, power companies could well argue that it is not worth the costs to add older reactors to the MOX-use plan. Specifically, some of the reactors that are likely to be restarted are currently between thirty and forty years old, but can operate for no longer than sixty years (and perhaps just forty). A reactor that today is, say, thirty-five years old would probably be forty-five, if not older, by the time it could be used to burn MOX (for reasons explained below), at which point it could only operate for another fifteen years. Moreover, because older reactors tend to produce less power than newer reactors, they cannot consume as much plutonium. In the most likely case, MOX burning will take place in only eight or nine reactors by 2023. Second, negotiations between the utilities over a new MOX-use plan are likely to be difficult, contentious, and prolonged. MOX fuel is more expensive than normal uranium oxide fuel—by a factor of nine, according to a recent estimate based on government data.132 As a result, power companies originally agreed to an “equality of misery,”133 in which each took on its fair share of MOX burning. In the future, however, such equitable burden sharing will not be possible. TEPCO, Japan’s largest power company, may well not operate another reactor again, let alone burn MOX. A number of smaller utilities, including the Japan Atomic Power Company and Hokuriku Electric Power Company, may also be forced out of the MOX business, because all of their MOX-burning reactors—if not all of their reactors—may be forced to close. As a result, a demand-side solution would almost certainly require a few companies—Kyushu Electric Power Company in particular—to take on a disproportionate share of the MOX burden, something they are likely to resist strongly. Third, even if some power companies do agree to take on more than their fair share, the host communities of their reactors may not. Decisionmakers in the Kyushu area, for example, could well come under intense pressure not to consent to multiplelocal reactors burning MOX when local officials in Shizuoka or Niigata have withdrawn or refused to grant such consent for anyof their reactors. Fourth, even if all these challenges can be overcome, the time needed to develop and then implement a revised MOX-use plan is likely to be significantly longer than the time needed to restart RRP and ramp it up to full production. It will be very difficult—if not impossible—to develop a credible plan for MOX use until there is much greater clarity about the future composition of Japan’s reactor fleet. Unfortunately, it may take years for such clarity to emerge, given the time needed for engineering upgrades, the NRA’s assessments, and negotiations with local communities. After additional reactors for MOX burning have been identified, consent from local communities for MOX use must be sought, contracts for fuel fabrication must be signed, and fuel must be produced and delivered.134 All of this is likely to take at least a decade, if not longer, as illustrated by Japan’s experience of trying to implement its original MOX-burning plan. Even if Japan has enough operating reactors in the future to ensure that, in theory, plutonium demand could be matched to supply, the practical challenges of revising the current MOX-use plan—and doing so on the requisite timescale—are daunting. To make matters worse, the construction of much of J-MOX is currently on hold pending the outcome of the NRA’s safety review. Until this facility comes online, Japan will have no way of using its domestically produced plutonium, regardless of its progress in restarting reactors and developing a modified MOX-burning plan. Japanese national policy is to operate Rokkasho Reprocessing Plant (RRP) at full capacity as soon as possible while not separating excess plutonium. Given the challenges facing the country in bringing its reactor fleet back online after the Fukushima Daiichi accident, it is highly unlikely that it can fulfill these two goals simultaneously. In the most likely scenario, RRP will be delayed by only a few more years, and it will be brought into operation without the reactor capacity required to consume its output. As a result, Japan’s domestic plutonium stockpile will start to grow significantly, quite possibly by 2.5 metric tons of fissile plutonium (equivalent to 4 metric tons in total) per year—a serious loss for nonproliferation. To be sure, this outcome is not completely guaranteed. If the Nuclear Regulation Authority (NRA) assesses that RRP is built on an active fault, which appears possible but unlikely, it could rule the plant is unsafe to operate, forcing it to be permanently shut down.135 Less dramatically, further severe delays to the plant’s start-up could result from an unexpectedly prolonged NRA assessment, the installation of major new safety features required by the NRA, unforeseen technical problems after start-up, or some combination of these factors. In this case, it is possible that, by the time the plant is up and running, Japan could have developed and implemented a revised plan for using mixed oxide (MOX) fuel and thus avoid stockpiling more plutonium. However, such severe delays to RRP seem unlikely.136 Japan also has an extremely strong incentive to avoid this scenario because, without reprocessing, reactors may be forced to close due to a lack of space for spent-fuel storage. By contrast, Japan’s current plan—to start RRP within the next few years with enough MOX-burning reactors in operation to ensure that no more plutonium is stockpiled—is probably the least likely outcome. Tokyo should develop a plan to ensure that plutonium supply and demand are in balance. To have any chance of succeeding, a solution to Japan’s plutonium problem must accept the realities of Japanese domestic politics. The particularly strained relationship between the center and periphery is a general feature of Japanese politics. On nuclear issues, relations between Aomori Prefecture and Tokyo are unique only in the degree of mistrust: many of the prefectures that host nuclear power plants are also among the country’s least developed—which is, of course, precisely why they agreed to accept the plants—and feel similarly marginalized. These tensions might not matter if local politicians did not have the power to veto changes in Japan’s nuclear policy. However, Japanese local politicians dohave effective veto authority, and they are willing to use it; as a result, realistic policies must seek to navigate around them. The steps that Japan could now take fall into one of three categories. In the short term, it could seek to reduce the supply of separated plutonium and to develop alternative ways to dispose of it. In the longer term, it could explore the possibility of shifting to the once-through fuel cycle in which spent fuel that has not been reprocessed is placed in a geological repository. The most obvious way for Japan to reduce its supply of plutonium—terminating RRP or delaying its operation for some prolonged period—is politically a nonstarter. Operating the plant at a lower throughput—so it processes less spent fuel and produces less plutonium—is a potentially more realistic option. Yet, even this proposal may be challenging to implement because it could spark concern in both Aomori Prefecture and Rokkasho Village that it is actually the first step toward the abandonment of reprocessing. Nonetheless, this idea is still sufficiently promising to be seriously pursued. It may also be possible to reduce the supply of plutonium imported from Europe. The British government has officially offered to take custody of Japanese plutonium stored in the United Kingdom—if acceptable commercial terms can be negotiated.138 Tokyo, which has so far not responded to this offer, could initiate negotiations with London. The British government’s lack of a credible strategy for managing its own plutonium stockpile clearly makes this option less than ideal, but from a security perspective, there are advantages to ensuring that as much Japanese plutonium as possible remains in a nuclear-weapon state outside the region. Japan could also explore the possibility of reaching a similar agreement with France. Both states would, however, almost certainly insist on returning all reprocessing wastes to Japan. Japan could attempt to develop an alternative way to dispose of separated plutonium, thus providing a way to deal with whatever material it cannot burn in reactors. Various alternatives to MOX burning have been proposed, including burying plutonium in deep boreholes or mixing it with high-level radioactive waste, so it requires no more security than normal spent fuel and could ultimately be placed in the geological repository being developed to accommodate Japanese high-level waste. Further research on all the alternatives is required, and Japan could now undertake it, possibly in collaboration with the United States and the United Kingdom, both of which also have large plutonium stockpiles and no credible disposal plans. Perhaps most importantly, Japan could explore the possibility of extricating itself from reprocessing over the longer term. Perhaps most importantly, Japan could explore the possibility of extricating itself from reprocessing over the longer term. In addition to the nonproliferation advantages of doing so, there are at least three reasons related to good governance. First, Japan’s fast breeder reactor program, which has always been the long-term justification for reprocessing, is in jeopardy following the Fukushima Daiichi accident. Second, it will be increasingly difficult to justify the costs of operating RRP if the number of reactors in which MOX can be burned remains limited over the long term, which is a distinct possibility. Third, Japan has already produced some spent fuel that is scheduled to be reprocessed at a second reprocessing plant that is supposed to follow RRP—and it will produce much more in the future.139 Given the extraordinary challenges of developing another reprocessing facility—not the least of which is persuading the Diet to spent tens of billions of dollars—Japan could start to explore whether there is an alternative. To this end, while continuing to reprocess, Japan could take the steps necessary to switch to the once-through fuel cycle, at some time in the future, should it choose to do so. The Japanese government already appears to be taking some very tentative steps in this direction.140 It supports expanding the country’s interim storage capacity for spent fuel, which would help to ensure that reprocessing is no longer needed to prevent nuclear power plants from running out of storage space. However, for such plans to be realized, the government will need to find some way of altering the calculus of skeptical local politicians by, for example, offering bigger financial incentives to both the host village or town andthe host prefecture of dry-cask storage facilities. Tokyo has also said it intends to start research into the direct disposal of spent fuel. Again, it could go further and work with the Diet to change the law to allow funds that have been put aside for nuclear waste disposal to be used for the disposal of both reprocessing wastes and unreprocessed spent fuel. In addition, the geological repository that Japan is currently trying to develop could be licensed to accommodate spent fuel as well as high-level waste. What unites this set of recommendations is the need for the central government to take action. With a few exceptions, such as developing a geological repository, Tokyo has generally tried to avoid involving itself in spent-fuel management, arguing that reprocessing is a private enterprise undertaken by private companies. Although this claim is true, as far as it goes, it ignores the context: reprocessing is also Japan’s national policy, and the central government has given the utilities no choice but to reprocess. Moreover, in recognition of the acute international security concerns surrounding plutonium, Tokyo has adopted a clear policy that it will not accumulate more of it than Japan can use. As a result, it is right that the Japanese government should now take ownership of this problem. For its part, the Japanese government may be inclined to wait until it has a better sense of which reactors are likely to operate before developing a strategy. Unfortunately, waiting will probably make the problem even more vexing. The longer Japan Nuclear Fuel Limited publicly sticks to its goal of operating RRP at full capacity as soon as possible (after an initial ramp-up period), the more Aomori Prefecture and Rokkasho Village are likely to be concerned by any future change in policy. Meanwhile, developing a credible plan to use the plutonium separated in RRP—whether through MOX burning or some alternative disposal method—will take time and probably encounter considerable domestic opposition. Facing these challenges sooner rather than later will make it easier to limit the growth of Japan’s plutonium stockpile. In fact, it is partly because Japan has underestimated these challenges in the past that its stockpile of plutonium has grown to its current proportions. From a theoretical perspective, what stands out about Japan’s entrapment in reprocessing is the ability of local politicians to constrain the national government’s freedom of action on a matter of international importance. The most dramatic manifestation of this effect was overt threats from Aomori politicians to expel the spent fuel being stored in the prefecture and to ban the import of nuclear waste from abroad if RRP were shut down. However, the quiet but persistent refusal of local politicians to accept dry-cask storage at many reactor sites around the country has also played a major role in entrapping Japan in reprocessing. Although local politicians in Japan probably enjoy a unique degree of influence in national-level decisionmaking on nuclear policy, similar, if somewhat less intense, dynamics shape fuel-cycle policies in other countries—especially more democratic ones. The result is either plutonium accumulations or the risk of them. The quiet but persistent refusal of local politicians to accept drycask storage at many reactor sites around the country has also played a major role in entrapping Japan in reprocessing. Local opposition to dry-cask storage in Taiwan has lead Taipei to negotiate a draft contract for reprocessing in France. If this project proceeds, the separated plutonium would not be returned to Taiwan for nonproliferation reasons. However, there appears to be no credible plan for disposing of this material; the draft contract reportedly states that it is to be burned in unspecified “third party civilian reactors.”142 Another plutonium stockpile—this time in France—would be the likely result. In addition to warning of the risk that the reprocessing of Taiwanese and South Korean spent fuel could lead to the accumulation of plutonium, the Japanese experience provides other important lessons. Japan’s reliance on reprocessing as a spent-fuel management strategy—a consequence, at least in part, of domestic politics—risks compromising its energy security; if reprocessing is delayed for too long, storage space for spent fuel could run out, forcing reactors to close. South Korea and Taiwan will run similar risks if they try to compensate for the absence of adequate spent-fuel storage capacity with reprocessing. States that choose to reprocess anyway, in spite of the risks, could at least try to design their programs so that they can be terminated without completely intolerable costs. Avoiding entrapment is a good governance measure generally, but it is particularly important from a security perspective because nations entrapped in reprocessing are more likely to stockpile plutonium. One step would be not to treat reprocessing programs as tools for regional development. Specifically, reprocessing facilities could be located in economically vibrant regions that could withstand the consequences of the plant’s being scrapped, and not in highly underdeveloped regions that become reliant on them. Funding for reprocessing plants could also be designed so that, if the plant fails, utilities do not risk bankruptcy. In practice, this would probably mean that governments would need to fund plants directly through tax revenue. Finally, and perhaps most importantly, governments could secure adequate storage capacity for spent fuel to ensure that reprocessing is not necessary to keep reactors in operation. Certainly, each of these proposals would be extremely difficult to implement, and it is possible that any government contemplating them might ultimately decide that the costs of reprocessing outweigh any benefits. 1 Barack Obama, Remarks by President Barack Obama in Prague as Delivered, Prague, Czech Republic, April 5, 2009, http://www.whitehouse.gov/the-press-office/remarks-president-barack-obama-prague-delivered. 2 National Nuclear Security Administration, U.S. Department of Energy, The Four-Year Report: Contributions of the Global Threat Reduction Initiative to Secure the World’s Most Vulnerable Nuclear Material by December 2013, 4, http://nnsa.energy.gov/sites/default/files/nnsa/12-13-inlinefiles/2013-12-12%204%20Year%20Effort.pdf. 3 The Hague, The Hague Nuclear Security Summit Communiqué, March 25, 2014, para. 21, http://www.nss2014.com/sites/default/files/documents/the_hague_nuclear_security_summit_communique_final.pdf. 4 Pakistan is known to produce HEU for military purposes. India and North Korea are probably also doing so. The six states with civilian reprocessing programs are China, France, India, Japan, Russia, and the United Kingdom. 5 International Atomic Energy Agency, Communication Received From Certain Member States Concerning Their Policies Regarding the Management of Plutonium, INFCIRC/549, March 16, 1998, 14, para. 13, http://www.iaea.org/sites/default/files/infcirc549.pdf. 6 For example, Frans Berkhout, Tatsujiro Suzuki, and William Walker, “The Approaching Plutonium Surplus: A Japanese/European Predicament,” International Affairs 66, no. 3 (July 1990): 523–43; William Walker, “Destination Unknown: Rokkasho and the International Future of Nuclear Reprocessing,” International Affairs 82, no. 4 (2006): 743–61. 7 Masafumi Takubo, “Wake Up, Stop Dreaming: Reassessing Japan’s Reprocessing Program,” Nonproliferation Review 15, no. 1 (March 2008): 83. 8 International Atomic Energy Agency, Communication Received From Japan Concerning Its Policies Regarding the Management of Plutonium, INFCIRC/549/Add.1/17, October 10, 2014, http://www.iaea.org/sites/default/files/infcirc549a1-17.pdf. 9 International Atomic Energy Agency, IAEA Safeguards Glossary, International Nuclear Verification Series 3 (Vienna: International Atomic Energy Agency, 2002), 23, http://www-pub.iaea.org/MTCD/publications/PDF/nvs-3-cd/PDF/NVS3_prn.pdf. 10 “JNFL Delays N-Fuel Reprocessing Plant Completion Again,” Jiji Press Ticker Service, October 30, 2014. 11For example, “Nuclear Security and Japan’s Plutonium Path,” Brookings Institution, Washington, DC, March 14, 2014, 19–20 and 48–49, http://www.brookings.edu/~/media/events/2014/3/14%20nuclear%20japan/20140314_japan_plutonium_transcript.pdf; Masafumi Takubo and Frank von Hippel, Ending Reprocessing in Japan: An Alternative Approach to Managing Japan’s Spent Nuclear Fuel and Separated Plutonium, Research Report 12 (Princeton, NJ: International Panel on Fissile Materials, November 2013), http://fissilematerials.org/library/rr12.pdf. 12Japan Atomic Energy Commission, Nuclear Fuel Cycle Options, provisional translation, June 21, 2012, 1, http://www.aec.go.jp/jicst/NC/about/kettei/kettei120718_e.pdf. 13Energy and Environment Council, Government of Japan, Innovative Strategy for Energy and Environment, provisional translation, September 14, 2012, 5, available at http://web.archive.org/web/20121211081225/http://www.npu.go.jp/en/policy/policy06/pdf/20121004/121004_en2.pdf. 14Government of Japan, Strategic Energy Plan, provisional translation, April 2014, 53–55, http://www.enecho.meti.go.jp/en/category/others/basic_plan/pdf/4th_strategic_energy_plan.pdf. 15William Walker, “Entrapment in Large Technology Systems: Institutional Commitment and Power Relations,” Research Policy 29 (2000): 833–46. Other authors note Japan’s entrapment, but reach quite different conclusions about the ease of extrication. See, in particular, Takubo and von Hippel, Ending Reprocessing in Japan. 16The concept of veto players was introduced to nuclear policy by the political scientist Jacques Hymans in an analysis of Japan’s nuclear program before the Fukushima Daiichi accident. Jacques E. C. Hymans, “Veto Players, Nuclear Energy, and Nonproliferation: Domestic Institutional Barriers to a Japanese Bomb,” International Security 36, no. 2 (Fall 2011): 154–89. 17For example, Kurt M. Campbell and Tsuyoshi Sunohara, “Japan: Thinking the Unthinkable,” in The Nuclear Tipping Point: Why States Reconsider Their Nuclear Choices, eds. Kurt M. Campbell, Robert J. Einhorn, and Mitchell B. Reiss (Washington, DC: Brookings Institution Press, 2004),243; Richard J. Samuels and James L. Schoff, “Japan’s Nuclear Hedge: Beyond ‘Allergy’ and Breakout,” in Strategic Asia 2013–14: Asia in the Second Nuclear Age, eds. Ashley J. Tellis, Abraham M. Denmark, and Travis Tanner (Seattle: National Bureau of Asian Research, 2013), 240–41. 18“Joint Statement by the Leaders of Japan and the United States on Contributions to Global Minimization of Nuclear Material,” March 24, 2014, http://www.whitehouse.gov/the-press-office/2014/03/24/joint-statement-leaders-japan-and-united-states-contributions-global-min. 19 For an example of a Chinese statement, see Ministry of Foreign Affairs of the People’s Republic of China, Foreign Ministry Spokesperson Hua Chunying’s Regular Press Conference, June 9, 2014, http://www.fmprc.gov.cn/mfa_eng/xwfw_665399/s2510_665401/t1163678.shtml. For a discussion of Chinese concerns, see Hui Zhang, “China Worries About Japanese Plutonium Stocks,” Bulletin of the Atomic Scientists, June 17, 2014, http://thebulletin.org/china-worries-about-japanese-plutonium-stocks7248. 20 For example, Seyed Hossein Mousavian, The Iranian Nuclear Crisis: A Memoir (Washington, DC: Carnegie Endowment for International Peace, 2012), 33. See also Nicholas Wright and Karim Sadjadpour, “The Neuroscience Guide to Negotiations With Iran,” Atlantic,January 14, 2014, http://www.theatlantic.com/international/archive/2014/01/the-neuroscience-guide-to-negotiations-with-iran/282963. 21 Takubo and von Hippel, Ending Reprocessing in Japan, 30. 22 Takubo, “Wake Up, Stop Dreaming,” 74. After Rokkasho Village agreed, in 1985, to host the nuclear facilities, the project was enshrined as the federal government’s development plan for the region. 23 Masakatsu Ota, “One More Myth: The Illusion of the Nuclear Fuel Cycle; The Roots of the Curse. Part 3: Making a Fool of Aomori: The Inerasable Memories of Betrayal” (in Japanese), Fukushima Minyuu, December 21, 2013. 25 Multiple interviews with the author, Aomori Prefecture, May 2014. 26 Aomori Bureau of Nuclear Planning, Aomori Prefectural Government, Atomic Energy Administration of Aomori (in Japanese), February 2014, http://www.pref.aomori.lg.jp/soshiki/energy/g-richi/files/2014-0303-2350.pdf. 27 See the comments by then Aomori governor Masaya Kitamura in Aomori Prefectural Assembly, Minutes of the Aomori Prefectural Assembly (in Japanese), April 9, 1985, available from http://asp.db-search.com/aomori/. 28 “Concerning the Final Disposal of High-Level Radioactive Waste” (in Japanese), Agreement Between Aomori Governor Kitamura and Science and Technology Agency Director Makiko, vol. 6, no. 148, November 19, 1994, reprinted in Aomori Bureau of Nuclear Planning, Atomic Energy Administration of Aomori,152. 29 Andrew Pollack, “A Waste Ship, Briefly Barred, Reaches Japan,” New York Times, April 26, 1995, http://www.nytimes.com/1995/04/26/world/a-waste-ship-briefly-barred-reaches-japan.html. 30 “Negotiations to Begin on Safety Agreement for Rokkasho Reprocessing Plant,” Atoms in Japan 41, no. 3 (March 1997): 21–22. Safety agreements are discussed in more depth below. 31 See, for example, the comments by Kimura in Aomori Prefectural Assembly, Minutes of the Aomori Prefectural Assembly (in Japanese), June 23, 1998. 32 See, in particular, the quote from Kimura in “Aomori Governor Gives Go-Ahead to Unload HLW,” Atoms in Japan 42, no. 4 (April 1998): 6. 34 Takubo, “Wake Up, Stop Dreaming,” 77–78. 35 Takubo and von Hippel, Ending Reprocessing in Japan, 32. 36 Yuusuke Onuma, “One More Myth: The Illusion of the Nuclear Fuel Cycle; The Roots of the Curse. Part 2: The Village Dependent on Nuclear Fuel: Nuclear Accident Creates Skepticism” (in Japanese), Fukushima Minyuu, December 19, 2013. 37 Ibid. See also Yukari Sekiguchi, “Politics and Japan’s Rokkasho Reprocessing Plant,” Policy Perspectives, Center for Strategic and International Studies (September 2014): 8, http://csis.org/files/publication/140912_Sekiguchi_Rokkasho_PolicyPerspectives.pdf. 38 Sekiguchi, “Politics and Japan’s Rokkasho Reprocessing Plant,” 7–8. On the electricity subsidies, see Aomori Business Development Bureau, “Main Breakdown of Monetary Support and Compensation” (in Japanese), Aomori Industrial Location Guide, http://aomori-ritti-guide.jp/03_yugu/hojyo.html. 39 “Three Energy Development Laws: ¥17.7 Billion Distributed to Aomori Prefecture; ¥10 Billion Given for Eight Consecutive Years” (in Japanese), Kahoku Shimpo, June 10, 2014, https://web.archive.org/web/20150323142420/http://www.kahoku.co.jp/tohokunews/201406/20140610_21015.html; Aomori Prefecture, “Expenditure Financial Results of General Account in FY2013” (in Japanese), September 19, 2014, http://www.pref.aomori.lg.jp/kensei/yosan/kessan_saisyutsu_25.html. In total, Aomori Prefecture has received about ¥348 billion in subsidies (through 2012). Extracted from Aomori Bureau of Nuclear Planning, Atomic Energy Administration of Aomori, 60–68. 40 E-mail communication, Rokkasho Village, December 2014. In total, Rokkasho Village has received about ¥50 billion in subsidies (through 2013). Rokkasho Village, “Total Allocations From the Three Power Laws” (in Japanese), February 2, 2014, http://www.rokkasho.jp/index.cfm/7,890,17,html. 42 Tax Division of the Administration Office, Regarding the Concurring Opinion of the Minister of Internal Affairs and Communications on the Renewal of the Tax on the Handling of Nuclear Fuel Items (in Japanese), March 7, 2014, http://www.pref.aomori.lg.jp/release/files/2013/49715.pdf. 43 Ombudsman, “Nuclear Profiteering Distorted Local Budgets” (in Japanese), August 20, 2011, http://www.ombudsman.jp/nuclear/yugami.pdf. 44 International Energy Agency, “Japan: Electricity and Heat for 2010,” http://www.iea.org/statistics/statisticssearch/report/?country=JAPAN&product=electricityandheat&year=2010; Japan Ministry of Economy, Trade, and Industry, The Strategic Energy Plan of Japan: Meeting Global Challenges and Securing Energy Futures, summary, June 2010, 10, http://web.archive.org/web/20141124003849/http://www.meti.go.jp/english/press/data/pdf/20100618_08a.pdf. 45 Office for Atomic Energy Policy, “Policy Decisions Concerning Step 2” (in Japanese), Presentation to the Ninth Meeting of the Subcommittee on Nuclear Power and Nuclear Fuel Cycle, March 1, 2012, 6, http://www.aec.go.jp/jicst/NC/tyoki/hatukaku/siryo/siryo9/siryo2.pdf. 46 Japan Atomic Energy Commission, Nuclear Fuel Cycle Options, 1–2. 47 Richard J. Samuels, 3.11: Disaster and Change in Japan (Ithaca: Cornell University Press, 2013), 134–36. 49 Takeichi Hashimoto, Statement Requesting the Continuation of the Nuclear Fuel Cycle (in Japanese), September 9, 2011, http://www.rokkasho.jp/index.cfm/11,491,c,html/491/20111005-170808.pdf. 50 Japan Atomic Energy Commission, Transcript of the Twelfth Meeting of the Conference to Formulate a New Framework (in Japanese), January 26, 2012, 22, http://www.aec.go.jp/jicst/NC/tyoki/sakutei/siryo/sakutei14/siryo5.pdf. 51 Samuels, 3.11, 130–34 and 147. 52 “Close to 70 Percent Favor Zero Nuclear Plants in 2030,” Asahi Shimbun, August 6, 2012, http://ajw.asahi.com/article/0311disaster/fukushima/AJ201208060006. 53 “Noda Gives No Quarter in Meeting With Anti-Nuke Activists,” Asahi Shimbun, August 22, 2012, http://ajw.asahi.com/article/0311disaster/fukushima/AJ201208220079. 54 Aomori Prefecture, Statement on Nuclear Policy and Fuel Cycle Policy (in Japanese), August 22, 2012, http://www.pref.aomori.lg.jp/release/files/2012/42191.pdf. 55 “Nuclear Fuel Cycle Review: Aomori Governor Has Meeting With Cabinet Ministers: ‘Give Sufficient Consideration to Aomori’” (in Japanese), Nikkei, August 22, 2012, http://www.nikkei.com/article/DGXNASFS2202H_S2A820C1PP8000. 56 Cabinet Office, Government of Japan, Transcript of Press Conference With Goshi Hosono (in Japanese), September 4, 2012, http://www.cao.go.jp/minister/1109_g_hosono/kaiken/2012/0904kaiken.html. 57 Energy and Environment Council, Minutes of the Thirteenth Meeting of the Energy and Environment Council (in Japanese), September 4, 2012, 5, http://www.cas.go.jp/jp/seisaku/npu/policy09/pdf/20120911/gijiyoshi13.pdf. 58 Energy and Environment Committee of the Democratic Party of Japan, Aim for a “Nuclear Zero Society”: Moving Forward Together on an Impressive, Yet Realistic Change (in Japanese), September 6, 2012, 6, http://www.dpj.or.jp/download/7932.pdf. 59 Masakatsu Ota, “One More Myth: The Illusion of the Nuclear Fuel Cycle; The Roots of the Curse. Part 4: A Melded Composition: ‘Line of Defense’ Against Changes in National Policy Plans” (in Japanese), Fukushima Minyuu, December 22, 2013; Takeichi Hashimoto, Statement Requesting the Continuation of Spent Fuel Plan (in Japanese), September 7, 2014, http://www.rokkasho.jp/index.cfm/11,491,c,html/491/20120910-180634.pdf. 60 Innovative Strategy for Energy and Environment, 5. 61 The report merely recognized, in vague terms, Japan’s nonproliferation commitments. 620 See, for example, “Ties Remain Tight Between Atomic Energy Commission, Nuclear Industry,” Asahi Shimbun, May 26, 2012, http://ajw.asahi.com/article/0311disaster/fukushima/AJ201205260060. 63 Takubo and von Hippel, Ending Reprocessing in Japan, 17 and 29–30. 64 Moreover, prospect theory suggests that Aomori and Rokkasho would tend to discount the loss of future earnings. 66 Official figures are available in English from Sekiguchi, “Politics and Japan’s Rokkasho Reprocessing Plant,” 10. 67 Energy and Environment Council, Minutes of the Thirteenth Meeting of the Energy and Environment Council, 5. 68 In fact, there was not nearly enough space in the pools of older reactors to accommodate all the spent fuel they had produced, although, in theory at least, some of this fuel could have been stored in the pools of newer reactors. 69 Japan Atomic Energy Commission, Transcript of Eighteenth Meeting of the Conference to Formulate a New Framework (in Japanese), May 9, 2012, 25, http://www.aec.go.jp/jicst/NC/tyoki/sakutei/siryo/sakutei18/siryo4.pdf. 70 In theory, another option would have been to develop a large off-site storage facility that could accommodate fuel from all over the country. 71For technical calculations based on reactor characteristics, see Takubo and von Hippel, Ending Reprocessing in Japan, 46. 72 “Toward a Nuclear Garbage Site (Part 13): It’s Only a Mid-Term Nuclear Storage Facility Being Built in Mutsu” (in Japanese), Fukui Shimbun, February 17, 2013, http://www.fukuishimbun.co.jp/localnews/nuclearpowerplantfuture/40468.html. 73 Kyodo, “Kepco Cool to Nuclear Facility Invite,” Japan Times, July 15, 2004, http://www.japantimes.co.jp/news/2004/07/15/national/kepco-cool-to-nuclear-facility-invite/#.VFvqAc8o670. Kansai Electric Power Company has also made unsuccessful efforts to find a site in a different prefecture. 74 Perhaps unsurprisingly, there is a striking similarity between Fukui’s politics and Aomori’s: individual municipalities’ primary motivations are often economic, whereas the prefectural government also worries about the ultimate fate of spent fuel. 75 Chubu Electric Power, “Hamaoko Nuclear Power Station Replacement Plan, Etc.,” December 2008, http://www.chuden.co.jp/english/resource/ir/en_others_20090212_02_2.pdf. The license application for this facility was submitted in January 2015. 76 This paragraph is largely based on various conversations with Japanese industry officials and experts. 77 This total also includes a relatively small quantity of bonds. Japan Nuclear Fuel Limited, Annual Company Summary: Thirty-Fourth Fiscal Term From April 1, 2012 to March 31, 2013 (in Japanese), June 2013, 15, http://www.jnfl.co.jp/public_archive/7-2-34.pdf. 78 Radioactive Waste Management Funding and Research Center, “Fund Administration,” http://www.rwmc.or.jp/english/fund_administration_1. 79 Japan Atomic Energy Commission, Minutes of the Eleventh Meeting of the Subcommittee on Nuclear Power and Nuclear Fuel Cycle (in Japanese), April 12, 2012, 35–36, http://www.aec.go.jp/jicst/NC/tyoki/hatukaku/siryo/siryo15/siryo4.pdf. For a partial translation, see Takubo and von Hippel, Ending Reprocessing in Japan, n. 111. 81 Energy and Environment Council, Minutes of the Thirteenth Meeting of the Energy and Environment Council. 82 “Nuclear Arms Talk Accompanies Japan Atomic Power Phaseout Debate,” Global Security Newswire, July 31, 2012, http://www.nti.org/gsn/article/japan-atomic-power-phase-out-debate-has-weapon-dimension. 83 For example, the remarks by Robert Einhorn at “Nuclear Security and Japan’s Plutonium Path,” 28; Charles D. Ferguson, Nuclear Energy: What Everyone Needs to Know (Oxford: Oxford University Press, 2011), 81. 84 Samuels, 3.11, 224 n. 5. 85 Yoshihiko Noda, Remarks at Meeting of Energy and Environment Council, Tokyo, Japan, September 14, 2012, http://japan.kantei.go.jp/noda/actions/201209/14kaigi_e.html. 86 Government of Japan, Strategic Energy Plan, 54. 88 Tatsujiro Suzuki, “Japan’s Plutonium Breeder Reactor and Its Fuel Cycle,” in Fast Breeder Reactor Programs: History and Status, Research Report 8, 55–56 (International Panel on Fissile Materials, February 2010), http://fissilematerials.org/library/rr08.pdf. 90 Quoted in Takubo, “Wake Up, Stop Dreaming,” 83. 91 William Walker, Nuclear Entrapment: THORP and the Politics of Commitment (London: Institute for Public Policy Research, 1999), 48. 92 Existing light-water reactors are sometimes described as thermal, as opposed to fast, because of the energy distribution of neutrons in their cores. 93 “JNFL Begins Study of MOX Fuel Fabrication Business,” Atoms in Japan 43, no. 3 (March 1999): 10. 94 For safety reasons, existing reactors could only be licensed to have one-third of their uranium oxide fuel replaced by MOX. Ohma was designed with the necessary safety measures to permit a full core of MOX. For numerical data, see Federation of Electric Power Companies of Japan, Plans for the Utilization of Plutonium to Be Recovered at the Rokkasho Reprocessing Plant (RRP), FY2010, September 17, 2010, http://www.fepc.or.jp/english/news/plans/__icsFiles/afieldfile/2010/09/17/plu_keikaku_E_1.pdf. 95 “First Public Hearing on Full-Core MOX Use at Ohma NPS,” Atoms in Japan 43, no. 2 (February 1999): 11. 96 Chico Harlan, “In Japan, Two Years After Fukushima Nuclear Accident, Work Resumes on New Plant,” Washington Post, March 10, 2013, http://www.washingtonpost.com/world/asia_pacific/in-japan-two-years-after-fukushima-nuclear-accident-work-resumes-work-on-new-reactor/2013/03/10/d572879c-83d6-11e2-a350-49866afab584_story.html. 97 This is probably a result, at least in part, of local politicians’ ability to effectively shut down reactors (by, for example, prohibiting the import of fresh fuel) if a safety agreement were ignored. 98 Takubo, “Wake Up, Stop Dreaming,” 84–85. 99 Federation of Electric Power Companies of Japan, “A Review of the Pluthermal Programs,” press release, June 12, 2009, http://www.fepc.or.jp/english/news/message/1198617_1653.html. 100 In the late 1990s, Tokyo Electric Power Company secured consent for Fukushima Daiichi unit 3 and Kashiwazaki-Kariwa unit 3 to burn MOX. However, consent was withdrawn in 2002 after the company was found to have falsified the results of safety inspections. “Prefectural Governments of Niigata and Fukushima Completely Retract Their Prior Consent to the Plu-Thermal Program,” Nuke Info Tokyo 92 (November/December 2002): 11, http://www.nirs.org/reactorwatch/accidents/nit92.pdf. The company succeeded in winning back consent for Fukushima Daiichi unit 3. However, its relations with Niigata Prefecture, where Kashiwazaki-Kariwa is located, remained extremely poor. For example, “Niigata Governor Asks METI Minister for Effective Inspection System,” Atoms in Japan, February 20, 2007, www.jaif.or.jp/en/. 101 Tokai Village had a strongly anti-nuclear mayor, who was opposed to MOX burning. For example, Tokai Village, Minutes of the Village Regular Meeting (in Japanese), March 10, 2010, http://tinyurl.com/o2479dr. 102 Masumi Suga and Emi Urabe, “Regulator Vouches for Safety of Third Nuclear Plant in Japan,” Washington Post, May 20, 2015, http://washpost.bloomberg.com/Story?docId=1376-NOL18W6TTDS901-1BNVFUJCMN094VE97QJ6AN7M6J. 103 “Kyushu Electric Moves Back N-Reactor Restart to Aug.,” Jiji Press Ticker Service, June 1, 2015. 104 “2 More Aging N-Reactors in Japan to Be Decommissioned,” Jiji Press Ticker Service, March 18, 2015. 105 For the most recent version of the plan, released prior to the Fukushima Daiichi accident, see Federation of Electric Power Companies of Japan, Plans for the Utilization of Plutonium to Be Recovered at the Rokkasho Reprocessing Plant (RRP), FY2010. 1060 Tokyo Electric Power Company, “Decommissioning of Units 5 and 6 at Fukushima Daiichi Nuclear Power Station,” press release, January 31, 2014, http://www.tepco.co.jp/en/announcements/2014/1233973_5932.html. 107 “(Update 2) Uchibori Wins Fukushima Gubernatorial Race,” Jiji Press Ticker Service, October 26, 2014. 108 “Niigata Governor Opposes Nuke Plant Restarts, Criticizes TEPCO,” Asahi Shimbun, July 3, 2012, http://ajw.asahi.com/article/0311disaster/fukushima/AJ201307030055. 109 For example, ibid. ; “Niigata Governor Calls TEPCO’s Turnaround Plan a ‘Pie in the Sky,’” Asahi Shimbun, January 16, 2014, http://ajw.asahi.com/article/0311disaster/fukushima/AJ201401160065. 110 Antoni Slodkowski and Kentaro Hamada, “Tepco Can’t Yet be Trusted to Restart World’s Biggest Nuclear Plant: Governor,” Reuters, October 28, 2013, http://www.reuters.com/article/2013/10/28/us-japan-nuclear-tepco-idUSBRE99R0KR20131028. 111 “11 Municipalities Permit JAPC’s Application” (in Japanese), Asahi Shimbun, May 14, 2014, http://www.asahi.com. 112 Jiji, “Tokai No. 2 Applies for Safety Check,” Japan Times, May 20, 2014, http://www.japantimes.co.jp/news/2014/05/20/national/tokai-2-applies-safety-check/#.VItusc8o670; Nuclear Regulation Authority, Enforcement of the New Regulatory Requirements for Commercial Nuclear Power Reactors, July 8, 2013, 15, http://www.nsr.go.jp/data/000067212.pdf. 113 Kyodo, “NRA Concludes Fault Under Tsuruga Reactor Is Active,” Japan Times, March 25, 2015, http://www.japantimes.co.jp/news/2015/03/25/national/nra-concludes-fault-under-tsuruga-reactor-is-active/#.VTpoS8_D-70. 115 In an interview published in April 2014, Kawakatsu stated that the plan to burn MOX at Hamaoka “is to be postponed, in other words, void [hakushi].” Masakatsu Ota, “A Decision on [Nuclear Reactor] Restart With Citizen Vote” (in Japanese), Yamanashi Daily, April 10, 2014, 4. Kawakatsu repeated these comments in an interview with this author two months later and further stated that it was Chubu Electric Power Company that had originally decided to postpone MOX use. 116 “Plu-Thermal at Hamaoka Reactor Unit 4: Governor Says That Scrapping Plan Is Necessary” (in Japanese), April 3, 2014, Shizuoka Shimbun. 117 Interview, Heita Kawakatsu, May 20, 2014, Shizuoka City. 118 Kyodo, “Nuclear Stance Helps Shizuoka Gov. Kawakatsu Win Second Term,” Japan Times, June 17, 2013, http://www.japantimes.co.jp/news/2013/06/17/national/politics-diplomacy/nuclear-stance-helps-shizuoka-gov-kawakatsu-win-second-term/#.VMqujs8o670. 119 Fissile plutonium, a concept used in Japanese MOX-utilization plans, refers only to the isotopes plutonium-239 and plutonium-241. 120 During testing, RRP processed 425 metric tons of uranium in spent fuel and produced 2.348 metric tons of fissile plutonium, implying that 800 metric tons of uranium would yield 4.4 metric tons of fissile plutonium. The statement in the introduction that RRP can separate roughly 8 metric tons of plutonium per year refers to total, not fissile, plutonium. Japan Nuclear Fuel Limited, Regular Report Concerning Rokkasho Reprocessing Plant (in Japanese), February 2015, 2, http://www.jnfl.co.jp/safety-agreement/pdf/1502recycle-safety.pdf; Office for Atomic Energy Policy, The State of Japan’s Plutonium Management (in Japanese), September 16, 2014, 2, http://www.aec.go.jp/jicst/NC/iinkai/teirei/siryo2014/siryo31/siryo3.pdf. 121 “Faults Under Shika N-Plant May Be Active: NRA Team,” Jiji Press Ticker Service, May 13, 2015. 122 “Factbox—Outlook for Japan Nuclear Reactor Re-Starts,” Reuters, April 2, 2014, http://in.reuters.com/article/2014/04/01/japan-nuclear-restarts-idINL4N0MT0K020140401. 123 “Divided Opinions on Nuclear Reactor Restart” (in Japanese), Asahi Shimbun, March 6, 2014, http://www.asahi.com/; “Nonhost Municipalities Seek Right to Speak About N-Plant Restart,” Jiji Press Ticker Service, July 24, 2014; Eric Johnston, “Kepco Weighs New Lease of Life for Geriatric Reactors,” Japan Times, November 24, 2014, http://www.japantimes.co.jp/news/2014/11/23/national/kepco-weights-new-lease-life-geriatric-reactors/#.VM1RV0um3wI; “Questionnaire for Local Leaders Within a 30-Kilometer Radius of a Nuclear Power Plant” (in Japanese), Asahi Shimbun, March 12, 2014, http://www.asahi.com/special/energy/jichitai_enquete.html. 124 “The Plu-Thermal Reactor at Hokuriku Power’s Shika Nuclear Plant: ‘Steadily Continuing With Our Plan’” (in Japanese), Nikkei, October 10, 2011, http://www.nikkei.com/article/DGXNASJB1900B_Z11C11A0LB0000. 125 “Staged Support May Delay Plu-Thermal Project in Hokkaido,” Jiji Press Ticker Service, August 29, 2011. 126 “Shimane Governor’s Re-election Is Also a Re-examination of Plu-Thermal Power” (in Japanese), Yomiuri Shimbun, April 11, 2011, http://www.yomiuri.co.jp/election/local/2011/localnews/05/20110412-OYT8T00702.htm; Mastue City, Transcript of Press Conference With Mayor [Masataka Matsuura] (in Japanese), April 10, 2014, http://www1.city.matsue.shimane.jp/. 127 Eric Johnston, “Fukui Court Forbids Takahama Nuclear Plant Restart,” Japan Times, April 14, 2015, http://www.japantimes.co.jp/news/2015/04/14/national/crime-legal/critical-case-fukui-court-rule-takahama-nuclear-plant-restart/#.VTq4JM_D-70. 128 “J-Power Applies for Safety Screening for Oma N-Plant,” Jiji Press Ticker Service, December 16, 2014. 129 “Nuclear Operators Push to Open New Plant, Extend Life of Aging Reactors,” Asahi Shimbun, November 14, 2014, http://ajw.asahi.com/article/0311disaster/fukushima/AJ201411140068. 130 By definition, the ratings in the table, ni, are related to pi, the author’s estimate of the probability that a reactor will be available for MOX burning by 2023 by pi= (ni-1)/6 (where i indexes the reactors). The expected number of reactor restarts is thus ∑pi, and the expected quantity of fissile plutonium consumed by all reactors is ∑qi pi, where qi is the quantity that can be consumed in reactor i. 131 Federation of Electric Power Companies, “Comment on the Newspaper Reports About the Plutonium-Thermal Program,” November 18, 2014, http://www.fepc.or.jp/english/news/message/__icsFiles/afieldfile/2014/11/21/press_e_20141118.pdf. 132 Jiji, “MOX Imports Have Cost at Least ¥99.4 Billion, Much Higher Than Uranium Fuel,” Japan Times, February 22, 2015, http://www.japantimes.co.jp. 133 Walker, “Destination Unknown,” 750. 134 It would generally not be possible for additional reactors designated for MOX burning to use MOX fuel that has already been ordered or produced for other reactors. 135 David Cyranoski, “Japan Nuclear Plant in Quake Risk,” Nature 453 (June 5, 2008): 704, http://www.nature.com/news/2008/080604/pdf/453704a.pdf. 136 RRP consists largely of French technology. The problems identified during testing were with the vitrifier, which turns high-level waste into glass and is the only Japanese-designed system in the facility. Although the possibility of further problems cannot be ruled out, RRP’s similarity to the existing French facility at La Hague makes them unlikely. 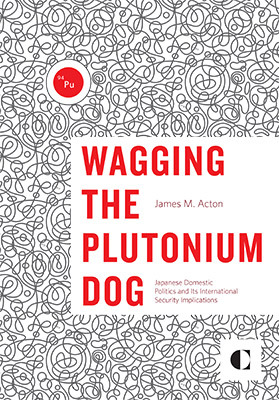 137 James M. Acton, A Realistic Approach to Solving Japan’s Plutonium Problem, Policy Outlook (Washington, DC: Carnegie Endowment for International Peace, September 2015). 138 Department of Energy and Climate Change, Management of the UK’s Plutonium Stocks: A Consultation Response on the Long-Term Management of UK-Owned Separated Civil Plutonium, December 1, 2011, para. 1.8, http://www.gov.uk/government/uploads/system/uploads/attachment_data/file/42773/3694-govt-resp-mgmt-of-uk-plutonium-stocks.pdf. 139 Neither irradiated MOX fuel nor the spent fuel that is due to be stored at Mustu is due to be reprocessed at RRP. 140 Government of Japan, Strategic Energy Plan, 51–53. See also “Nuclear Waste Disposal Problem,” Japan Times, February 22, 2015, http://www.japantimes.co.jp/opinion/2015/02/22/editorials/nuclear-waste-disposal-problem/#.VPJT30um3wI. 141 Walker, “Entrapment in Large Technology Systems,” 837. 142 Shaun Burnie with Mycle Schneider, “Taiwan Tenders Spent Fuel Reprocessing Contract,” IPFM Blog, March 18, 2015, http://fissilematerials.org/blog/2015/03/taiwan_tenders_spent_fuel.html. See also “Taiwan Reprocessing Tender Suspended,” World Nuclear News, March 20, 2015, http://www.world-nuclear-news.org/WR-Taiwan-reprocessing-tender-suspended-2003151.html. 143 According to reports, the recently concluded—but not yet released—nuclear cooperation agreement between South Korea and the United States does not give the former long-term programmatic consent to reprocess, but it does require negotiations over this issue in the future. Duyeon Kim and Mark Hibbs, “What the New U.S.–South Korea Civil Nuclear Cooperation Agreement Means,” Carnegie Endowment for International Peace, April 13, 2015, http://carnegieendowment.org/2015/04/13/what-new-u.s.-south-korea-civil-nuclear-cooperation-agreement-means.